KUALA LUMPUR: Axis Real Estate Investment Trust (REIT) Managers Bhd views the property market in the Klang Valley as “saturated” and high land prices are driving potential investments away into fairly newer but cheaper areas. Impressive: Labrooy shows his company’s second-quarter results, with net profit surging 23%. Its chief executive officer and executive director, Stewart LaBrooy, cited examples in Shah Alam where companies were selling their land and moving their factories away to other areas such as Nilai. “The Klang Valley is now too expensive for a lot of investments (such as) in Shah Alam. Land prices for industrials in Shah Alam for recent transactions are now about RM120 per sq ft (psf) compared with Petaling Jaya 10 years ago at RM90 psf. It is getting to a point where Shah Alam will not be able to have price points to support industries per se,” LaBrooy told a media briefing on the company's second quarter ended June 30 earnings. “So you are finding industries now moving out to areas (such as) Nilai which is where we are (also) buying now. They are selling their land for high prices and moving their factories out because it is just getting too expensive or the value is too good to ignore as they can build brand new facilities and do just as well. The office market in Kuala Lumpur was “just too expensive” and not feasible to be bought due to the ample amount of supply, he said, aadding that the outlook would be challenging moving forward. On this saturated market backdrop, Axis REIT would now focus on the property markets in Penang and Johor Baru and adjust the strategy accordingly. The company had just completed the purchase of two properties named 1 Logistics DC in Bayan Lepas and Prai, Penang, this year and it is also eyeing another two properties in Johor. “We are also buying two properties in Petaling Jaya but this came about basically because it is owned by our promoters of the REIT. One of the directors owns the building so we can get it at a very good price. We got that at a big discount and we're going to redevelop it and enhance the asset so that we can get a much better return for our shareholders,” he said. Meanwhile, LaBrooy pointed out that the fall in yield differentials between Malaysian and Singapore REITs showed that the market was very bullish on the growth of Malaysian REITs. Axis REIT is presently in negotiations to acquire several properties mainly located in the Port of Tanjung Pelepas in Johor and could purchase up to seven additional properties by the end of this year compared with five acquisitions last year. “It is quite challenging but we find it very rewarding to find good assets to put into the REIT,” he said, adding that in general, the managers would always maintain gearing levels below 40%. 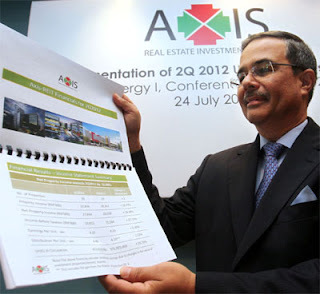 Axis REIT reported second-quarter net profit surging 23% to RM19.45mil with revenues rising to RM32.88mil from RM28.44mil in the same period a year ago.